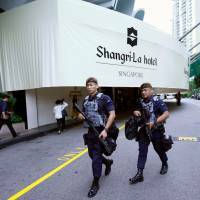 SINGAPORE - For the region’s military officers, diplomats, weapons manufacturers and spies, there are few livelier places than the lobby of Singapore’s Shangri-La hotel around midyear. Here, beneath pillared ceilings and chandeliers, they gather for an annual informal bash — called the Shangri-La Dialogue — organized by the London-based International Institute for Strategic Studies. This year’s chapter was held over the weekend and the chatter was particularly lively given the strategic shifts shaking Asia, from North Korea to rapidly-evolving rivalry between India and China. In the ballroom, Indian Prime Minister Narendra Modi outlined his vision for a “rules based order” for the region before U.S. Defense Secretary Jim Mattis championed the “Indo-Pacific region” — both evolving constructs that Chinese officials eye as containment. But in the lobby, the hushed talk was decidedly spicier, particularly given the looming appearance of North Korean leader Kim Jong Un and U.S. President Donald Trump for their historic summit in Singapore later this month. 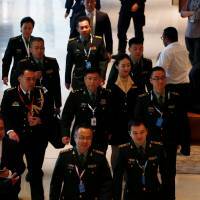 Retired Western and Asian intelligence figures spend the best part of three days loitering here; a civilian-suited Vietnamese military officer introduces himself to a U.S. naval counterpart while a cadre of Chinese PLA staff walk briskly past. A Laotian military representative practices his golf swing as a gaggle of barefoot teenagers pad past from the swimming pool, toweling themselves down and apparently oblivious to the swirl of strategic tension. 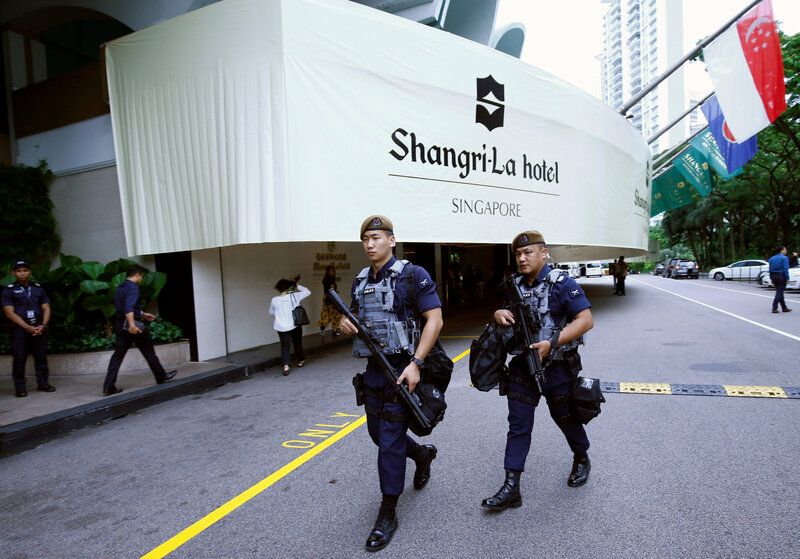 Outside, heavily armed Singaporean police guard the hotel’s driveway. While the IISS scholars organized a variety of panels covering regional flash-points and trends and diplomats arranged formal bilateral meetings for their defense ministers, the siderooms, bars and cafes are even busier as more discreet business is done and information traded. 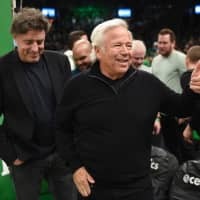 “It is a very good event,” said Maj. Gen. Sahibzada Isfandiyar Pataudi, a retired Pakistani military intelligence official, as he relaxed at a Friday night reception. Regional military attaches say the event is a legendary recruitment spot, as officers and diplomats are tapped by business or academia — and sometimes more shadowy enterprises. One delegate said Singapore’s status as a leading financial hub helps. 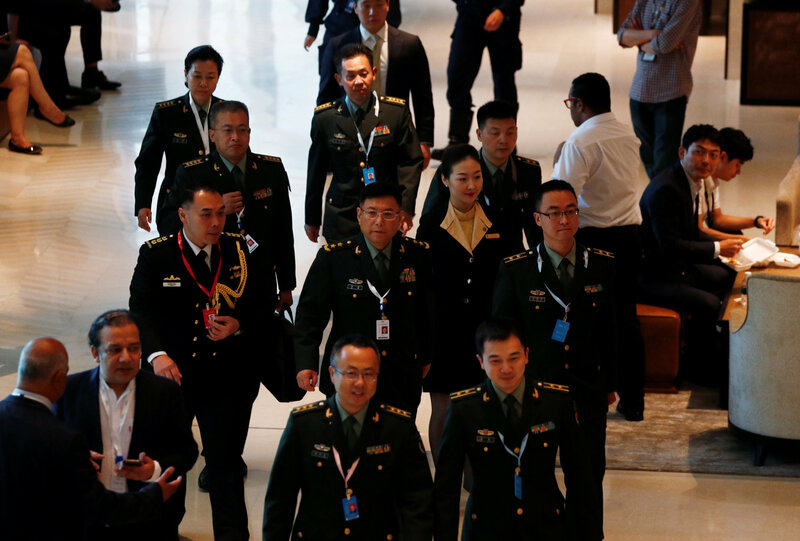 For journalists, the meeting is a great opportunity to prowl the corridors to meet defense officials and senior military officers who are rarely approachable in their home countries — or at more cloistered formal diplomatic events. 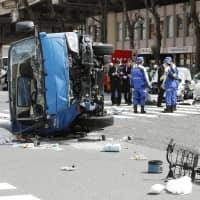 The Shangri-La meetings to which the journalists are invited are lively and scores of senior officials speak on major events and are willing to be questioned. As well as the IISS, the sponsors of the Shangri-La Dialogue include major Western defense firms, including Boeing, Airbus, BAE Systems, Lockheed Martin and Raytheon — in part a reflection of gradually rising regional defence budgets. 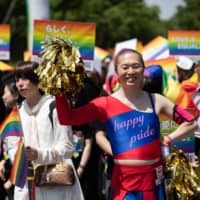 Gene Cunningham, Boeing’s vice president of global sales, defense, space and security, said the informal nature of the event was important in a large, diverse region where people may view “the same set of facts differently. “This is not a trade show, this is not an air show,” he said.